In 2018 we adapted the web site to the new data privacy requlations (GDPR). For details please refer to our Privacy Statement / Data Protection Policy containing information according to Art. 13 GDPR. Many live sample demo applications (most notably the RADpage demo itself) were removed from the website. They can be used and tried out by downloading and installing the download package of our software. In case of questions please contact us per email at . Windows XP, SuSe 11.1, SuSe 12.2, and Fedora 21 versions are now available. Windows XP, SuSE 12.1, SuSe 12.2, SuSe 12.3, Fedora 16, Fedora 18, and Fedora 19 versions are now available. Windows XP, SuSE 12.1, SuSe 12.2, Fedora 16, and Fedora 18 versions are now available. 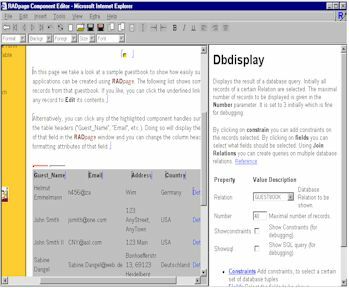 RADpage provides real WYSIWYG (and hybrid) editing of dynamic web applications and web page templates. RADpage executes pages during editing, always showing the end user's page view including generated code. RADpage provides server side and browser based Rapid Application Development. heitml (pronounced as HTML but Hi - TML) is an XML/HTML like programming language for Web applications. heitml 2.1 is integral part of RADpage. heitml 2.1 features object-oriented HTML extensions and component based application development. All the Web sites on the right, all the RADpage components and the RADpage application builder itself are implemented in heitml.